The Earth of the future is overpopulated and in need of new food supplies. On a small experimental hydroponics farm near Saturn, Adam (Kirk Douglas) and Alex (Farrah Fawcett), work alone, at least until the arrival of Benson (Harvey Keitel). Benson has supposedly been sent by the government of Earth to assist Adam and Alex by setting-up a robot called Hector. In reality Benson is a murderedous imposter. Benson is horny, unstable, and aggressive. The fact that Hector is programmed via Benson’s own mind only compounds the problems for Adam and Alex, who soon realize they are trapped in their own home with two maniacs. Coming out in 1980, Saturn 3 definitely looked to capitalize on the success of Alien (1979) with a moody violent story set in an isolated location. As it also existed in the wake of Star Wars (1977), it just had to open with a huge space ship slowly flying across the screen and feature a shiny android prominently in the plot. Setting the story on a hydroponics farm and describing an Earth in the throes of an overpopulation crisis feels like the last dying vestiges of the 1970’s brand of eco-aware SF. Saturn 3 never quite manages to meld these disparate elements into a singular film, it feels disjointed as it lurches from SF film, to horror film, to exploitation film, and back again to horror. The movie’s single biggest visual flaw is Hector, I’m still not sure what the creators were going for by realizing him as a hulking silver humanoid with a tiny desk lamp for a head. I’m sure it was supposed to be disconcerting, but it just looks silly and when the bulk of the movie hinges on Hector being a threat, his comical appearance becomes a problem. Far more successful is Harvey Keitel as Benson (although the director hated his New York accent and dubbed his voice), he’s cold to the point of almost being alien and his dogged pursuit of Alex goes from creepy annoyance to downright predatory. It’s fascinating to watch him come into conflict with Adam and Alex and then just easily become all business. You eagerly look forward to seeing him get his comeuppance, and that’s the mark of a good antagonist. For its numerous failings there are some magnificently tense scenes dotted throughout: Benson holding Alex’s eye open as Hector lumbers in to either remove a shard of metal or pluck her eye out and Alex and Adam laying a trap for Hector are two of the best. There are inklings of what Saturn 3 could have been was it not for a troubled production that saw it lose a director and much of its budget. 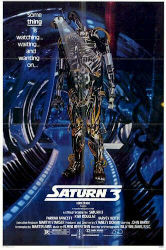 Saturn 3 is a problematic film, though still a watchable one. It wants to embody both the fantastical and the grounded SF elements that were influential at the time but this ends up costing the film its own identity.